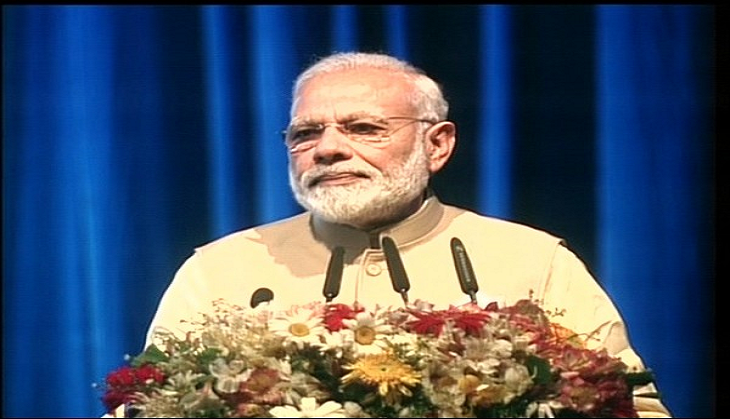 Prime Minister Narendra Modi on Friday chose the occasion of International Vesak Day function here to exhort the international community to work towards the sustainable world peace. Addressing the gathering after inaugurating the International Vesak Day function, Prime Minister Modi said, "The biggest challenge to sustainable world peace today is not necessarily from conflict between the nation states but it is from the mindsets, thought streams, entities and instruments rooted in the idea of hate and violence." In a veiled attack on Pakistan, the Prime Minister alluded to the pro-terror policies of Islamabad. "The menace of terrorism in our region is a concrete manifestation of this destructive emotion. These ideologies of hate and their proponents in our region are closed to notion of dialogue and hence only open to causing death and destruction," he said. "The themes of Social Justice and Sustainable World Peace resonate deeply within Buddha's teachings and they are both deeply interdependent and interconnected," the Prime Minister added. Lauding the Buddha's message of peace and truth, Prime Minister Modi said Lord Buddha's message is as relevant in the twenty first century as it was two and a half millennia ago. "The themes of Social Justice and Sustainable World Peace, chosen for the Vesak day, resonate deeply with Buddha's teachings. On Vesak let us light the lamps of knowledge to move out of darkness; let us look more within and let us uphold nothing else but the truth," he said. Mr Badal's drug war: Punjab has 70% addiction. He insists it's just 0.7!